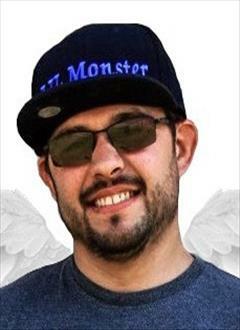 Antonio Castillo Jr., 34 of Callender, passed away on Tuesday, April 9, 2019. A Celebration of Life will be held on Sunday, April 14th from 1:00 PM to 7:00 PM at Rides Banquet Center 723 S. 31st Street in Fort Dodge. Lauferweiler-Sievers Funeral Home is serving the family. Survivors include his wife, Kylee of Callender; sons, Jadan Castillo, Adrien Castillo, Abel Castillo; daughters, Leila Castillo and Everly Castillo- step daughter, Addison Fitzgerald; mother, Pam Schossow and his father, Antonio Castillo Sr. both of Fort Dodge; step mom, Lori Steinhofer of St. Michael, MN; grandmother, Jenny Castillo of Auburn, WA; and grandparents, Bob and Patty Schassow of Fort Dodge; brother, Joe Bergman of Fort Dodge; sisters, Jennifer Castillo of Fort Dodge; Lyndsie Castillo of Minneapolis, MN; A.J. (Nate) Klein of Fort Dodge; and Jesseca Montenegro of Fort Dodge; numerous aunts, uncles, nieces, nephews, and cousins. Antonio Castillo Jr. was born on February 21, 1985 in Paramount, CA. He attended schools there before the family moved to Washington State, Oregon, and later Minnesota. The family eventually established their home in Fort Dodge where he graduated from high school. Antonio then attended ICCC where he received his degree as a diesel technician. He was loving father and friend. Antonio was a state wrestling champion in Washington State. He was also an accomplished title holder in the MMA Fighting League. He enjoyed helping people and would never turn down a request from family or friends. "For those of you who knew him please don't forget him." "Antonio was always someone to look up to, he was a hard worker, a family man, and a true friend. " "I work at Hiway 20, he was my all time favorite customer. I seen him last week and we always made fun of each other in a funny way. He was so full of personality. You will he missed ??"